In this game, your characters are expected to get a couple of wounds on them as the scenario progresses. In order to prevent your characters from dying to these wounds, you can heal them. From the early days of the Core Set, there have been many cards that allow players to discard damage tokens on their characters, bringing new life to their allies and heroes, preventing you from losing them or eventually the game. For this article, I will discuss the best cards for each sphere that keep your characters alive. It is rare for one mechanic of the game to have little to no sphere bleed towards other spheres. Yet healing is almost exclusively matched to Lore, with only a handful of cards outside of the sphere that actually heal characters. For this article, I will not deal with damage cancellation, as it is not entirely the same thing as actual healing. I will give it an honourable mention, but it is just not the same thing. Healing is one of the things that Lore stands for, and it has done so since the early days of the Core Set. There is no rival to the throne, as the sphere keeps getting new ways to heal characters, while the mechanic is not really bleeding into the other spheres. Since there are so many excellent healing cards in this sphere, I will only handle one for each category. Though there are many great healers in the game at this point, none can quite match the flexibility and reliable healing that the classic Warden of Healing can provide. For the cost of 2, you get an ally that is able to heal 2 characters on the board for 1 point each. But that is not all: you can repeat this process for the cost of 2 Lore resources, allowing players to heal more than once with the same healer. This kicker is useful for Lore decks that tend to draw their deck early and then get stuck with a lot of resources. Having even more chances to heal characters is always welcome, especially in Archery or Direct Damage heavy quests like Weather Hills and Druadan Forest. The Warden is a very good ally, but is also quite fragile. With only 1 hitpoint of his own, he does not handle damage to himself well. This makes it difficult to use him at times, as you can only allow him to exhaust after the staging step, to prevent him from dying to a direct damage effect. 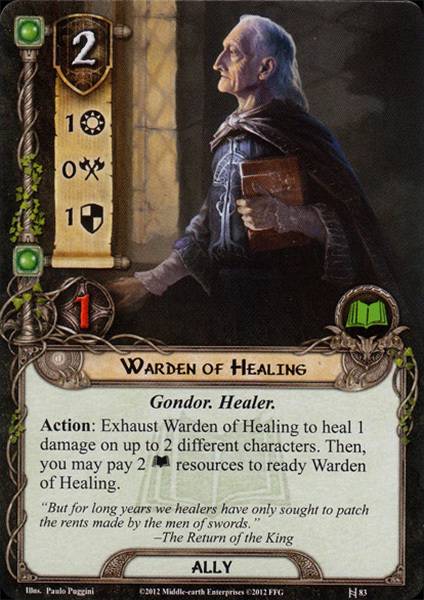 The Warden is also such a staple, that you rarely see other allies for healing in Lore decks besides him. This is not really a negative thing, but it would be nice to see something else on the table from time to time. Ioreth was a great contender for the crown of superior healer, but nothing can quite match having 3 Wardens of Healing in play. The ally is also one of the more flexible allies in this regard, since it is not trait specific healing like the Silvan Tracker, nor does it fuel another synergy like Imladris Caregiver. An excellent ally which will be with us for a long time before the developers either make him worse, or they bring out a new, even better, healer to the mix. This is one of the cards I generally add three copies of in the first deck I make with physical cards. But then I come to my second deck and think: “Crap, we’re all out of Lembas”, and then tell Sam to go home. Anyways, this is one of the biggest staples in any Silvan or Noldor build that runs Lore. Not only does this attachment heal 3 points of damage from the attached character, but it also readies that character. This is great for defenders, as they are simultaneously healed and readied for a potential second defence. This card is also a good fit for the two Ent heroes, who can damage themselves for their ability. It is worth while to get a cheap yet powerful healing attachment on those heroes to also ready them. This makes Quickbeam in particular a very powerful hero, with multiple actions each round. There are some draw backs to Lembas, as with any card. First of all, you must have either a Noldor or Silvan character in play, since only they can make the cakes. 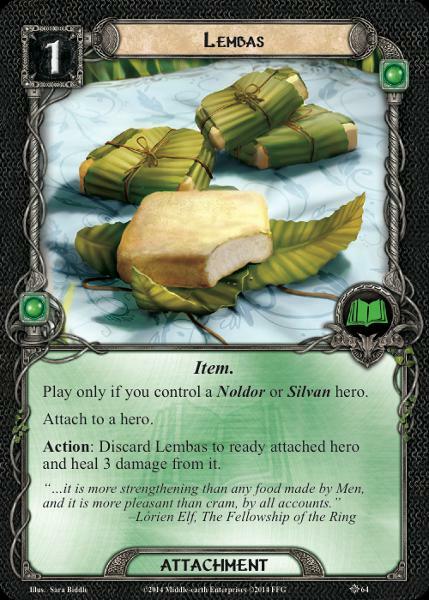 Second, it is a one time effect, and assuming you don’t recur the attachment, you will only get one use per copy of Lembas in your deck per game. There are ways to recur the attachment though, Erebor Hammersmith is in sphere and Lembas is a great card to pull back to your hand. Perhaps not as big a staple as the other cards on this list, but Lore of Imladris is pinpoint healing, which can be crucial in saving a character. The obvious case where you want to use this card is in Journey to Rhosgobel, where Wilyador makes for a perfect target. However, the card doesn’t reach its maximum capacity in that quest, as it is only limited to heal 5 damage off of Wilyador. In any other quest though, this little event can save a hero from death by healing all points of damage in one go. This is great if you have a Beorn during a Cold from Angmar in the Angmar Awakened quests, or for a Gloin deck that has him at death’s door after having boosted his hitpoints through the roof. This simple event can pinpoint any character and bring them straight back to full health. Of course there are cards like Beorn’s Hospitality and Waters of Nimrodel which do the same, but at a much higher cost (5 resources or 3 resources and 3 threat for each player). This kind of global healing effect can be very welcome to the group in the later stages of the game, when many characters are bruised and can’t take much more Archery damage. Resetting the damage on the board to 0 is amazing and should not be ignored in particular quests. Enough about Lore of Imladris, lets talk about the LORD of Imladris. Elrond is not a healing card on its own, but run him in any deck with healing, and he will accelerate it to insane levels. Whenever a character is healed by a player card effect, Elrond will heal an additional point of damage from that character. 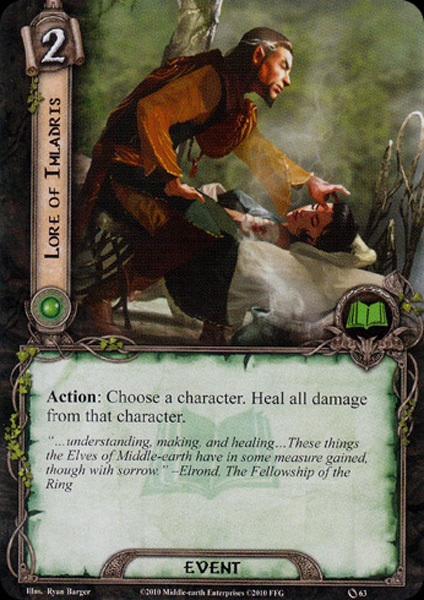 This increases the usefulness of Warden of Healing to insane levels, but Elrond also makes slightly worse healing cards substantially better. An example of this would be Lore Glorfindel, who now heals 2 points for 1 resource, instead of only 1 point of damage. Cards like Silvan Tracker combined with Elrond will do some amazing work for Silvan players, who can now soak 2 points of Archery on any Silvan character, with it being healed off immediately during the refresh phase. 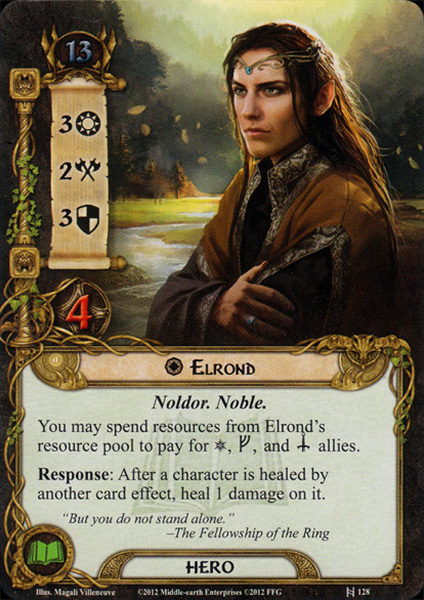 Besides increasing the healing potential of any deck, Elrond also smooths out resources when paying for allies, which is a nice touch for multisphere decks. You pay for this with your threat though, Other than Hero Gandalf, Elrond has the highest starting threat of any hero in the game at 13 (tied with Treebeard). This limits your deckbuilding options unless you feel comfortable with a total starting threat of more than 30. You can reduce his starting threat a little with Mirlonde, though that is a difficult card to justify over other heroes. The other problem you might encounter is that his ally form is also not uncommon. This version does directly heal other characters and is a great card in terms of versatility, though it does only last for a round. Make sure that players remove their copy of the ally from their decks if you are playing with the hero. Oddly enough, there are no healing cards in Spirit, nor is there any way to cancel damage dealt to you in this sphere. The best that Spirit can do, is to use effects like Desperate Defence and Tides of Fate to boost defence of a character, but once damage is done, you will have to look at other spheres to do the healing for you. Luckily, Spirit does give you plenty of ways to get your destroyed character back from the discard pile. Fortune or Fate can return dead heroes, while Dwarven Tomb and Stand and Fight can return allies to your hand or put them back in play. The only way to prevent real damage being dealt to heroes in Spirit is with Livery of the Tower. This attachment is more damage cancellation than healing, but it is the only way in that sphere to prevent those damage tokens from piling up. The Livery will require you to spend X resources to cancel X damage just dealt to the attached hero. This is quite a resource intensive attachment for a sphere that isn’t famous for pumping those resources out. The downside to this attachment is also that it can only attach to Gondor heroes (read: Beregond) and that the damage must first be dealt before it can be cancelled, unlike Honour Guard. This means that you cannot remove damage equal or greater than the number of hitpoints on the attached character, as it would first die before you would trigger the response on the Armour. Leadership has long been without any form of healing, and often resorted to just pumping out more allies. However, during the Dream-chaser cycle, they received a very valuable attachment that has become a staple for the sphere ever since. This 0 cost attachment is a great attachment to draw into during the mid-game. It allows the character to whom it is attached to heal for 1 point. This means that your first point healed will be free when you play the attachment from your hand. 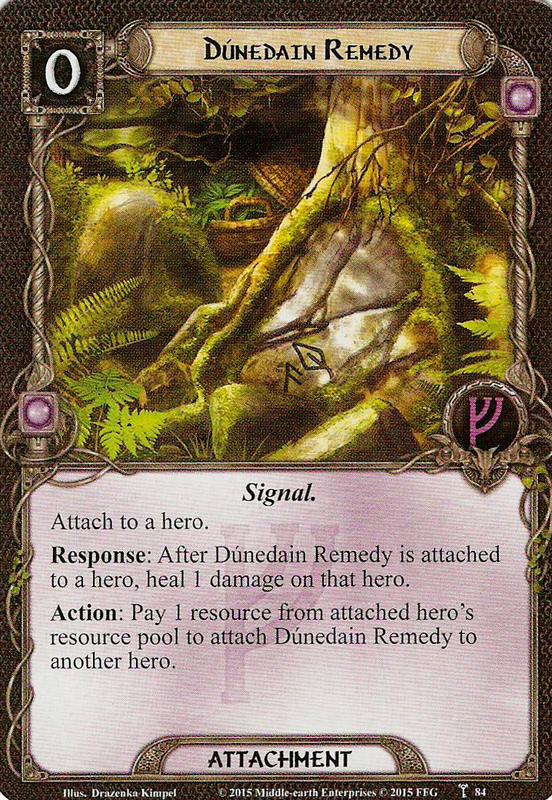 But the card wouldn’t be a staple if that is all that it did, since it is a Dunedain Signal, the attached hero can pay 1 resource from its pool to give the Remedy to another hero, even if they are controlled by another player. This triggers the healing effect again, healing potentially every hero across the table, provided you have enough resources to pay for it. In the long term, the Remedy can be an expensive way to heal heroes, around the same cost as Lore Glorfindel. However, Leadership tends to have plenty of resources during the mid-/late-game, so the healing can easily be purchased. Leadership also has a couple of options to provide other heroes with resources, so that they can pass the Remedy along. Being a 0 cost attachment, this Remedy is excellent in Dale decks, as they are as of this writing still lacking healing within the trait. Being a 0 cost attachment can allow for rapid card draw with Brand son of Bain, and it can also reduce the cost to play Dale allies by 1 in combination with King of Dale. There are very few downsides to running this card, as it is also not unique and not Restricted, making it a viable option in any deck with access to Leadership. The only problem is that the effect isn’t repeatable every turn (like Self Preservation) without spending resources. However, without a limit to how many times you can pass it around, this one attachment can heal multiple heroes without too much trouble. The fact that it cannot attach to allies is also a bummer, as they tend to get pretty beaten up as well. Try to include some other ways to heal them if you are finding yourself losing allies rapidly, the Remedy isn’t the cure to that problem. Like I mentioned earlier, Tactics is lacking cards that actually heal characters, but this doesn’t mean that they cannot take care of damage. Tactics is specialized in pseudo-healing, like damage cancellation, or damage redirection. Some notable cards in this mechanic are the Honour Guard, who can reliably prevent 1 point of damage dealt to any character, potentially saving a 1 hitpoint ally from dying before it could otherwise be healed. The Guard also has a Valour response to prevent 5 points of damage at the cost of discarding him. While this effect is less popular in the community, it can save you from an undefended attack in the late-game. For damage redirection, Tactics already had Song of Mocking early in the card pool. Recent additions like (Valiant Warrior?) have also made their way into the card pool, providing players with lightning rods when it comes to taking damage. Good characters for these attachments are for instance Gloin (gain more resources) and Gimli (allowing him to hit harder). Redirecting damage allows you to focus your healing on one character, potentially outfitted with Self Preservation to continuously heal that one character. The Neutral cards of the card pool offer some healing to decks that have no chance at healing on their own, particularly Tactics and Spirit decks. While not the best in their field, the flexibility they provide is often welcome when deckbuilding for damaging scenarios. White Tower Watchman is again a form of pseudo-healing, since it allows you to redirect damage dealt by undefended attacks to the ally. This comes at the caveat that you only run heroes from one sphere, limiting your deck options. However, this ally is a great escape hatch for spheres that do not have reliable defenders out early, like some Lore and Spirit decks. Lore also has a similar ally to the Watchman in Dori, who has a similar ability where dealt damage can be redirected to him instead. The ability to redirect any amount of damage dealt by an undefended attack is great to take care of a big enemy that you would otherwise lose a hero with. The Watchman doesn’t even have to be ready to trigger his ability, adding to his usefulness. The downside is that his stats are nothing to write home about, though they can be boosted in the Gondor synergy. Radagast is a bit of a sad story, as he has not yet found his way into many powerful decks yet that take optimal advantage of his abilities. Hopefully in the upcoming cycle, new Creature allies will appear, potentially allowing us to justify using Radagast again. Regardless, he is a specific type of healing for Creature allies only. This boils down to Eagles and allies like The Riddermark’s Finest and Wild Stallion. While this isn’t the best use of Radagast’s resources, it can allow you to save your Eagles of the Misty Mountains with 5 cards stacked underneath it. If you have no use of his resources in the late-stages of the game since your allies are already on the table, it is good to have a second option for them. This is the latest card on the list, but not the least powerful. 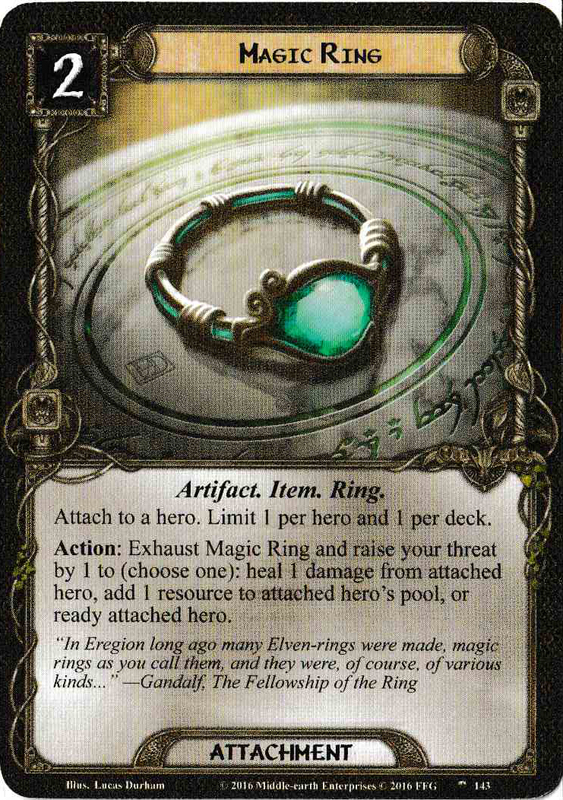 Magic Ring is a very interesting card, as it grants you a host of beneficial abilities, one of which is healing, but at the same time it also raises your threat significantly if you aren’t careful. The healing ability is probably not why you play this card, but for a Tactics or Spirit deck, it can be the only way to heal damage that has already been dealt, unless you channel Lore. The drawbacks to this card are obvious, but besides the threat, this is also a rare card to see, as it is only 1 copy per deck. But with the versatility that this card provides, being also able to ready or gain resources for threat is not a small feat for a single card, which is why you may come across it in your games now and then. I hope this gave you a clear insight in what cards to bring to the table when dealing with lots of damage on your characters. The ability to heal will always come in handy, and is always appreciated by other players. Many of the Healing cards can target characters across the table, making for a great addition to your multiplayer decks. This concludes yet another Staples article, I have no idea what mechanic to cover next, so I will be taking suggestions from the community for that.